There are some people around me that wash their face three or more times. They wouldn’t notice what they are doing. About 90% of people have sensitive skin and tells me that their skin changed to be sensitive and could see form the appearance. Some people who have flawless skin but always have some small pimples. They would be scare to wear any moisturizer because it might worsen the pimples. Also some people suffer from dryness with some pimples. So they would pay attention to the products that have effect on their skin and wears them all the time and washes off really clearly. The skin won’t get better and suffers from daily routine that isn't working. So saying the conclusion, the problem is on the product of the cleanser and how you are using it. It you don’t wash it properly, it will cause some blotches. Also too rough cleansing would be a problem. Most of the people go to the dermatology because of their rough cleansing routine. As I am one of the people who wash my face, I am interested into cleansing as well. The problem is on what product you use or not, it’s on the habit of washing your face. If you are using cleansing foam once than that’s not a problem. Having to wash you face twice is a problem. Also when you are not wearing a makeup, there are weak acid cleanser that won’t stimulate your face as much as before. - less stimulation on the face, maintain the healthy skin. - Erase off the makeup completely. - There are some cleanser that said to be removing the makeup completely by having to wash twice or not. - Choose a product that doesn’t need to wash if off twice. 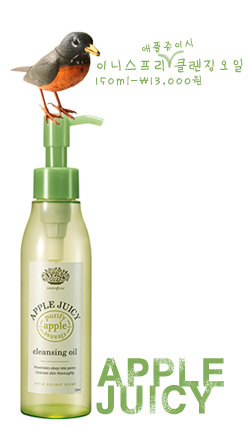 - So lessens the usage of cleansing foam. 3. If you like to wash your face twice and can’t sleep? - use a product that has weak acid than alkali cleaner. - Or wash it with a organic sponge that doesn’t stimulate and cleans off clearly. Don’t use a cleanser that is stimulating. It has to be very soft. Some people say that cleansing oil is strong. However that can’t be right. I use cleansing oil myself and I recommend this because it matches the state of the skin and the life style. The choice of cleanser changes according to the situation. For sensitive skin, no smell is preferable to use but personally I like products that have fragrant on them. 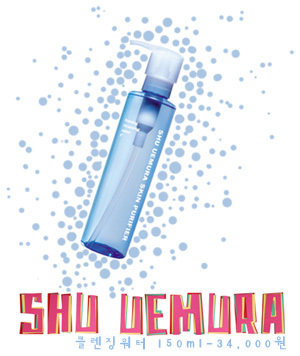 People who were using Shu Uemura wouldn’t feel any difference. Many of my friends didn’t felt the difference. I guess it’s up to the person. It can be finish with water only after using it and removes the eye makeup well. However I don't really recommend cleaning with oil using your hands only in removing eye makeup. It is hard to clean between the lashes so have to use cottons or cotton buds to erase off clearly. There would be some stains left around the eyes unless you rub it roughly. When I have to compare with other oil brands its light and finishes freshly. It is very different from other oils feeling very heavy. However there is some problem. One of the most important parts in using oil cleanser is to remove the blackheads and dry oil on the face. I feel that I didn’t felt that Bobbi Brown oil is removing the black heads. This oil cleanser is said to be use for all types of skin even oily type. However some people around me who have used this experience some small pimples. They were oily and mixed skin type. However for me, I didn’t have any pimples. I don't think of repurchasing this product. If you are willing to purchase a cleanser in this arrange cost than its ok to try out this cleanser. If you are not so sensitive like me you might like to use it for a new feeling. When you look only the color it’s almost like oil for cooking. However it’s very light and smells fresh. As like Bobbi Brown it feels fresh and light. It feels light and doesn't make your eyes sting. Especially the price is the greatest problem. There are some other products that have good effect. The price is 40,000won so you can’t really deny the price. The price makes me happy but the amount of the contain is not too satisfying. This product can be the leader among inexpensive cosmetics. As I have said before, the cleansing is really light. However in removing the blackheads would give less effect than the steady sellers. However for people who are using the organic sponge won’t be a problem. 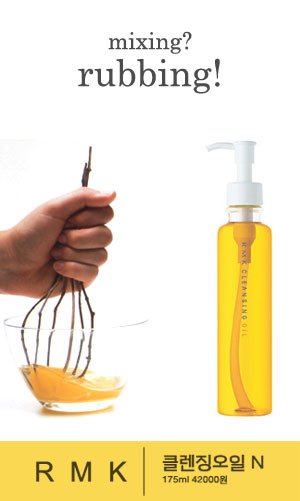 There is also Olive cleaning oil and the effect is similar to other oil cleansing. This cleansing water makes bubbles. There isn’t any difference comparing to other regular cleanser. Also after a pump the amount really shrinks. It said to be use after using the oil but personally I bought this because of my curiosity. First of all I don’t know if ShuUemura is really naïve. It isn’t stimulating but it pulls my skin after using other foam cleanser. I use this when I have light makeup on, like only face makeup. I pump it onto the facial cotton and wipe it off two times and clearly removes all the makeup. You can still some bubbles while wiping off with facial cotton. So after that washing with water cleans well. I really want to recommend this to use with a oil cleanser. Instead of this product I like Uriage product better. Some people asks me what can I clean my face if I have plastic surgery on. You can use water cleansing and you don't have to rinse off with water. I am saying within the limit of cleansing water. Does it really erase the makeup? I was curious so ordered it right away. When I received it and turn it up side down, its really bulk and how can’t there be no oil? I washed it off and saw that it turned really soft and washed away the oil. This cleanser erases off most of the basic makeup well. However in erasing the makeup, there are some difference in products but can erase the glitters so satisfied. The most satisfying part is that it can be used with wet hands. Instead of using the oil cleanser in dry face, this can be used as its wet. So during the shower it’s comfortable to use. Some people who don't like the feeling of oil should try this out, instead of washing your face two times with the oil and foam cleanser. This product produces bubbles in form of oil. The smell is nice and the bubbles are soft. It erases nicely except the strong eye makeup. Also it can’t be washed with water only. I finished one bottle already and I would repurchase it. Comparing to the O HUI product, the smell and the texture is different. There is only slight different in texture but I feel that O HUI bubbles is stickier meaning that there are more oil. So even though the price is 4 times expensive, I bought O HUI. The case of this is transparent not like O HUI so when you shake it, there is no feeling of bulkiness. It is more like a water cleanser. This also has a limit in cleansing off the eye makeup. So you have to erase the eye makeup with other remover well. 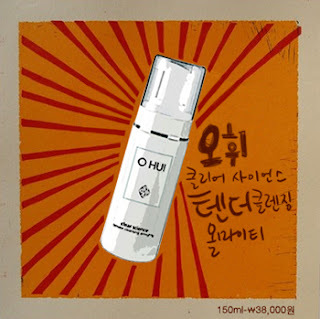 As like O HUI product, it has a limit in removing the black heads. You have to use organic sponge to take care of the skin. There are some people, which I would like to recommend. 1. People who feels uncomfortable washing the face twice. There are many cleanser that said to give whitening or anti aging but when you come to think of it, how that works? They’re some substance that is contained but washing it off right away doesn't work. So don't be seduced by the effect that cleanser gives. You won’t leave the cleanser for 10 to 20 minutes so purchase a cleanser that cleans the makeup well and gives no stimulation to your face.